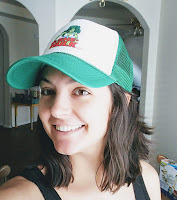 Synopsis (via Goodreads): Noura only wants to eat watermelon, until the night she sneaks a watermelon into her room and dreams of having all the watermelon she could ever want. I thought this book had a very James and the Giant Peach vibe, but that feeling didn't last very long. Noura was rude and extremely ill-tempered. She yelled at her mother with no consequence, and I thought her behavior should have at least been addressed. At the end the mother tells her daughter that they will discuss the "magical watermelon" the next day, but then the story ends. Why tell the readers your going to talk about Noura's dream, if you're not going to? The story was an okay read for me, and my son enjoyed it because of the watermelon theme (he's obsessed with them). I just feel like the story could have been more that what it was (a few more explanations, Noura being told that her behavior was unkind, etc.). Synopsis (via Goodreads): The Arctic region of North America is a land of long days, icy cold, hardy people and peculiar creatures. The Inuit people there have made traditional use of remarkable folk tales to find truth and explain the mysteries of an astonishing world. I really enjoyed this one! It was a little more in-depth than some of the others we've been reading, but my son didn't mind. I had to explain a few things that went over his head (like why this boy wanted a stranger to be his father), and he was happy to go along with it. The illustrations were beautiful and the story was fascinating. Fish-Boy is a story within a story, and I liked how they used an elaborate tale to explain why so many birds flocked to an island. They turned a simple question into a life lesson. Thanks for the mini reviews. I hadn't heard of these. 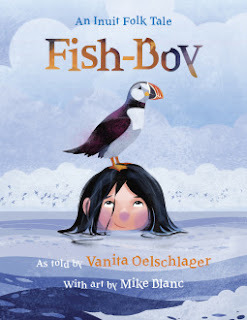 We really enjoyed Fish-Boy! 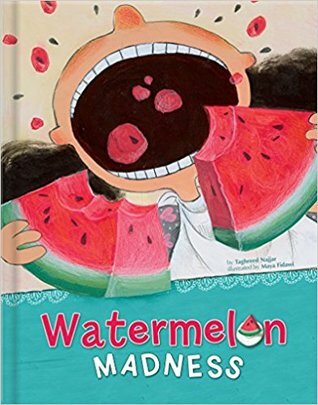 Watermelon madness was appealing, but failed to address important issues within the story. Fish-Boy was beautiful and enchanting. I agree that there were plenty of discussion points, and the story alone was wonderful. Just the name Watermelon Madness makes me think of my little brother, Lol. Does he like watermelon? My son wants watermelon everything! How said that her behavior wasn't addressed or at least a clear lesson given. Fish Boy sounds like a good one. Great reviews, I am always on the lookout for new books for the Royals. I would recommend giving Fish-Boy a try! The illustrations are gorgeous, and the story within the story was entertaining and educational. Watermelon Madness had the potential to be more, but the child's behavior wasn't addressed and the ending was weird. I thought we would learn more about her dream/reality, but it just ends with her eating a normal breakfast. Fish Boy looks like an interesting read. I read Watermelon Madness also, and had similar feelings of disappointment. It's unfortunate, because I feel the story had potential, it just didn't live up to it. I felt the same way! I think if the child's temper and selfish behavior had been addressed and improved on, the story would have felt more solid and satisfying. Unfortunately, no one ever tells her that her behavior is wrong/unkind and she continues to do whatever she wants. There wasn't a lesson learned or an idea achieved... it was just a girl that ate watermelon and had a bad dream (which was also never addressed). I wanted a lot more than I was given.